Davy Anderson JP was born in Aberdeenshire in 1891 and arrived in Malaya in 1913 to work for Harrison & Crosfield. Returning to the UK for World War 1 Army Service, he came back to Malaya in 1919 as Acting General Manager, Diamond Jubilee Estates 1919 [see photo gallery]. By 1931 he was a Visiting Agent for Sime Darby, a member of Rubber Control Restriction Committee and a Municipal Commissioner, Malacca. ​On holiday in Sydney in December 1941 with wife Dorothy and children, he returned to Malaya and was transferred from the Malacca LDC to the Food Control Dept, Singapore. A civilian internee in Changi & Sime Rd, he wrote this letter immediately after liberation. The letter appears courtesy of Davy’s son, Lyall Anderson, himself a post war planter in Malaya. I am writing this letter during the last few days of incarceration. With the prospect of liberty and freedom at our gates no words of mine can adequately express the overwhelming spirit of gratitude and thankfulness which the news of recent events has brought to us. We have been told to remain calm within the camp perimeter and give no cause for unpleasant incidents until our Forces arrive. Although the spirit among us is willing vitality and strength are such that no scenes of wild enthusiasm need be feared. During the long period of 3 1/2 years behind prison walls and barbed wire fences life has generally proved a pretty grim and monotonous business. Speaking for myself I can only say that I consider myself very fortunate indeed in having pulled through without any visible signs of health impairment apart from the loss of weight and strength. It is true that many of us are reduced to little more than bagfuls of bones but with some nourishing food and a modicum of home comforts health and strength will we hope soon be restored. At the risk of not boring you too much I propose to give you a very brief summary from my own personal observations covering the period of internment and the few days prior thereto. Should you find my subject uninteresting please destroy this letter in the nearest WPB. Going back to the days just prior to capitulation I feel that I am right in saying that the tragic hour of surrender came as a surprise to most people. The Governors statement to the Press , "Singapore shall not fall" was an ill-timed and purposeless announcement which led people to believe that Singapore would be defended. Surrender however put an end to the muddling which had been going on amongst our authorities and we at lest knew where we were. Some few days prior to the end I wrote you 2 letters in language which I thought might not offend the censor, but neither of these letters may have reached you. Up to the end I was in the employment of the Food Control Office distributing rice by lorries in Singapore town and districts. This job was not without adventures and hair-raising episodes especially when the Japs were getting close. After the Japs had entered the town 15-17 February 1942 all Europeans were mustered on the Padang (forenoon 17 February) and later marched off to Karakal and Jao Chiat places where our own troops had been in occupation about 5 miles East of the town. We were instructed to take clothes sufficient for 10 days. No provision in the shape of food or bedding was made for us but food supplies and odd quantities of bedding were later brought from Singapore. On 6 March we were again on the move and this time marched to Changi Prison where we were destined to take up residence until 2 May 1944. On the latter date we were transported by lorries to our present abode-Sime Road Camp,which is on the outskirts of the town. I may mention here that the above road is named after John Sime. Taking a retrospective view of these last horrible years and incarceration under Jap administration we have been compelled to live under the most heinous conditions. Medical men would have considered it impossible for any white race of people to survive had they known what we were to be confronted with in respect of food and general conditions. Never I believe has there been such a heterogeneous collection of humanity representing almost every trade and profession and speaking almost every known tongue within the walls of an internment camp or prison. In the "palatial building" of Changi Gaol three persons were crammed into one cell whilst others were allocated very limited space in the workshops and other places. In the prison my brother criminals in Cell 9- Floor3, Block B were Edmonds and Lewis. In course of time we were able to obtain camp beds or something in the shape of a mattress : also bare necessities of blankets etc. Many people however remained with little protection from the concrete and without a blanket. Time dragged on with monotonous regularity whilst the general standard of health steadily deteriorated. Rice was plentiful to begin with but rations soon tapered off until we were down to about 1600 calories per day-food values everything included. Meanwhile the death rate was increasing and Hospital cases were more numerous. The Doctors and Surgeons were doing wonderful work with a limited supply of drugs and very restricted facilities to work under. Like many others I managed to collect a dose of dysentery and also underwent a minor operation. I will take you now to 10th October 1943 a day which will live in the memories of all Internees : the day referred to as the double 10th. We were told that a roll call would be taken in the yards and were duly mustered at day -break. It was soon very evident that a roll call was not the object of the parade, but a search was being undertaken by the Gestapo. We were kept in the yards all day without food and no shade until nightfall. The search led to a number of Internees being taken away on the aforementioned and subsequent dates and this was the last we saw of some of our friends alive. Stevenson as you know lost his life as result of the search. It was a horrible and almost despairing thought when one wondered who would go next. Whilst examination of papers etc. found amongst the Internees belongings by the Gestapo at their headquarters outside the prison was in process various Committees had been functioning (in a quiet way) on post-war reconstruction policy and names disclosed through this medium apart from other misdemeanours in the eyes of the Japs described as mutiny were sufficient to lead to arrest. Some sleepless nights I may mention were spent in Blocck-3-9. The story will be told later of the Gestapo atrocities and cruelties of a most revolting order imposed upon our people which only could be compatible with the dark ages. All I will say here is that some of our Friends after months of imprisonment of a terrorising nature were brought back to Sime Road Camp either dead or dying with their bodies emaciated and shrivelled away next to nothing. There can only be one punishment for the perpetrators of these crimes. Punishment was also inflicted on people within the walls of Changi of a severity with no measure of justice for the trivial nature of the offences committed. No appeal or redress was possible as the Japs recognise no known law except their own. 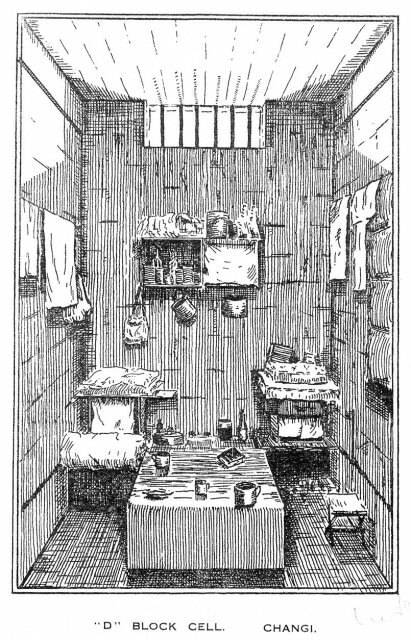 The period following the Double 10th was marked by a tightening up of all camp administration rules and curtailment of any small privileges we had such as a bathe in the sea once per month and a walk round the exterior of the prison walls in the evening. Food rations also suffered and all classes, lectures etc. were prohibited. Fortunately we had a good library which greatly assisted in wiling the time away. We were kept going on rumours mostly without any foundation as to the progress of the war. Rangoon was in the bag many times as also were parts of Java, Sumatra and other adjacent islands. It was significant however that some of the rumours proved later to be correct despite all the precautions taken by the Japs against contact with the outside world. Repatriation prospects were always considered good and this at least gave us some hope in an otherwise black horizon: nothing however materialised. At last a change of camp came suddenly and we set out for our present Camp on 2 nd May 1944 with a feeling of optimism that repatriation was this time almost certain. No one however was sorry to see the last of Changi whatever the future was to disclose. Sime Road Camp was pre -war occupied by the RAF and covered an area of some 175 acres with temporary huts scattered throughout. The land comprised parts of Bukit Timah Rubber Estate. The POW’s who were in occupation over part of the area were sent to Changi. The huts in places were in a very dilapidated state and no upkeep had been done in the immediate surroundings. When cleaning operations commenced sickness in the form of Typhus, Dysentery and Malaria broke out and caused a number of deaths. It was not long however before the whole area was under cultivation of sweet potatoes and other food crops. Tapioca was also planted outside the fences including part of Bukit Timah Golf Course. Despite the initial difficulties which had to be encountered in the new camp most people agreed that it was a pleasant change from Changi in view of the fact that we could at last see the surrounding country and there were more facilities for walking. Crowding was one of the main difficulties with space allotted per person 2 ½ x 6 ½ ft. It was with amazing rapidity that the Camp was organized into a going concern starting from scratch. Everything was of a makeshift order and utilitarian methods adopted showed the last word in skill and ingenuity. Towards the end there was increasing anxiety about the food situation. Two cuts were made in our rice ration which brought us to a dangerously low level. In addition to this the outside supply of vegetables was steadily dwindling and eventually ceased. The vegetables I may say would have been considered poor quality in normal times. 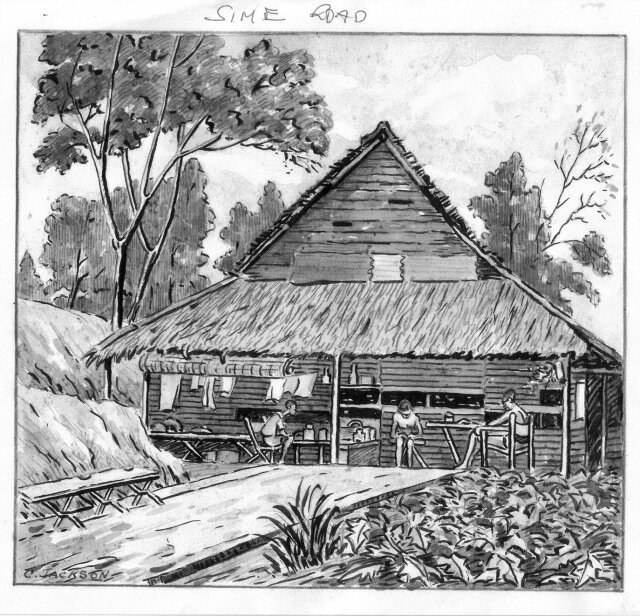 Daily rations consisted of Rice Kungie in the morning ; Potato Leaf Soup and some other green for lunch ; Vegetable Hash ,about ½ pint ,and Rice loaf and tea for supper. Weights of internees were steadily decreasing and as its train was leading to all forms of deficiency diseases we could not have stuck it much longer without serious consequences. I have omitted to mention that the whole Camp was regimented into working gangs of various categories according to age and fitness ; gangs such as the heavy chankelers were, after a time, given extra for 6 hours work. A good deal of work was being done solely for the benefit of the Japs. Mysterious work of tunnelling was carried out at the end within the Camp perimeter and no one knew for what purpose these tunnels were intended. I may mention here that I filled the duties of Camp Policeman for 3 years and the last 6 months transferred to a Potato Seed Garden which was started outside the fence. We were kept in complete ignorance as to the progress of the war and the usual tide of rumours flooded the Camp almost daily. Despite rigorous precautions however we got some reliable information now and then from newspapers printed in Singapore which were secretly smuggled in. Some 4 months from the end 1200 Jews and other rogues of various descriptions were interred with us and we were put wise to outside world events to some extent from this source. Food supplies again - in order to supplement diet black market supplies were being taken advantage of as far as possible. The Japs of course were getting their rake off in the first instance. For one egg we were paying 20/- to 50/-; Gula Malacca 75/- to 100/- per catti: Palm Oil up to 40/- per pint. Jap money or banana money as they were termed. The currency dwindled to practically no value at the end. People had sold practically all private belongings such as watches, jewellery, clothing etc. in order to try and get some extra food. Smokes were also scarce and some awful rubbish including papaya leaves were being smoked. Coolie cheroots were sold sometimes at 3/- each. Supplies from the Red Cross lorries - cereals tobacco etc. would come into the Camp now and then but prices although less than Black Market were absurdly high. As regards Red Cross Parcels we saw practically nothing until near the end when we got one each. Since then we have shared parcels on three occasions. It would seem clear that parcels dispatched to us were misappropriated. During the whole period of internment we were never given an opportunity of dealing direct with a Red Cross Representative and this of course was a great disadvantage. It is known that the camp Jap supervisor sold our rice and other rations and thereby reduced weights below what we should have been. Turning back to Changi Jail prior to the Double 10th Scientific men of all denominations, Doctors, Engineers, Accountants etc. organised classes and lectures on many subjects and this course of education was of great benefit to those who studied. I myself studied - General Science, Physiology, Astronomy, Book Keeping, Agriculture, Plant Breeding and First Aid. On the latter subject I sat the exam and obtained the Qualifying Certificate. Amongst the shadow committee working in Changi was a Rubber Industry Rehabilitation Committee consisting of practical men representing Agency houses and some other Senior V.A. planters. I was a member of this committee and we had prepared comprehensive memorandums dealing with suggested schemes for restoration of estates, compensation for retrogression replanting, the probable labour situation etc. Unfortunately all memorandum had to be destroyed as a result of the Double 10th and I have no particulars to give you at present. It was something in the shape of a miracle that the Gestapo did not get their hands on some of the written evidence of these meetings. Some of the other Committees were less fortunate with the result that some of their numbers met their deaths at the hands of the Gestapo. When the full story of the crime committee has been told it will make ugly reading . I have attempted to give you a very brief outline of the more important events of the period of internment. I could of course write pages on a more detailed description which would unavoidably include much of a detestable and cheerless nature and this would serve no useful purpose. Now that the dawn of a new world is before us I think that most of us wish to forget the 3 ½ years of wasted and purposeless life, apart from the misery and suffering we were unnecessarily subjected to. Internment under conditions experienced brought to the surface the finer qualities of individual character. On the other hand the reverse was evident I regret to say in too many instances amongst persons I had previously respect for. For those who had the courage, patience and staying power and have emerged with flying colours the past war years will hold out no future fears. On the contrary some of us will have more confidence and striking power than ever before and will without shame will face the new world where we will shortly find ourselves. Personally, I am now glad that I did not make a get away at the end although numerous times I cursed myself for being a fool during internment. At this stage of the proceedings we are awaiting developments and are all anxious to know what the outside world has in store for us. I have given a very sketchy outline of our turbulent misfortunes in life during the past 3 ½ years. With the dawn of a new day awaiting us I feel that the courage, endurance and patience which had to be borne by us during these dark days will not have been in vain.